Considering its indie origins, Octodad certainly looks the part, with highly polished graphics and menus looking like they’re straight from a AAA game developer studio. When Octodad was announced and shown off around the time of the PS4 announcements, I couldn’t have been more excited at the chance to play it. Here was a platform holder like Sony, bowing their head to an indie studio, and making way for a company that wouldn’t have been given the time of day 5 years ago. The Game looked goofy, fun, and all around a brilliantly unique game that I couldn’t wait to play for all of its ideals. Octodad was unfortunately delayed for the PS4, and as I haven’t got around to buying a PS4 just yet (my PC is more powerful than both the PS4 and Xbox One, and there just hasn’t been unique games yet) I decided to get the game on my PC. 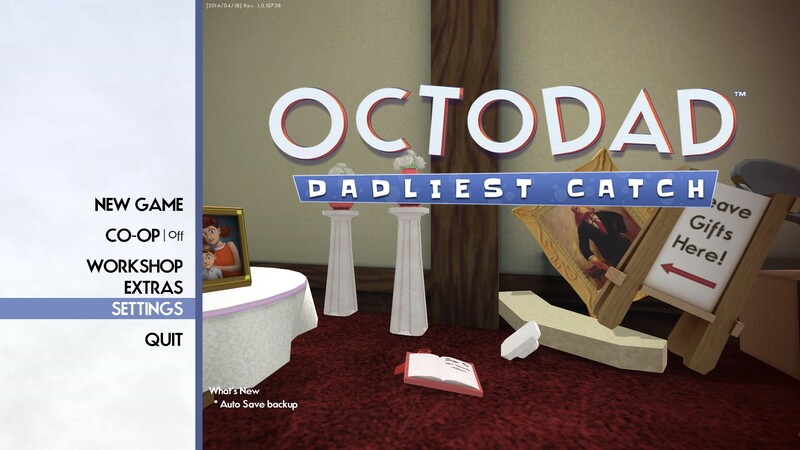 Did Octodad live up to my huge expectations? or was I just living a dream as to whats possible with indie development? Octodad is a game based around seemingly ordinary things we do thorughout our lives, as Octodad tries to fool everyone around him into believing he’s another human, just like us. 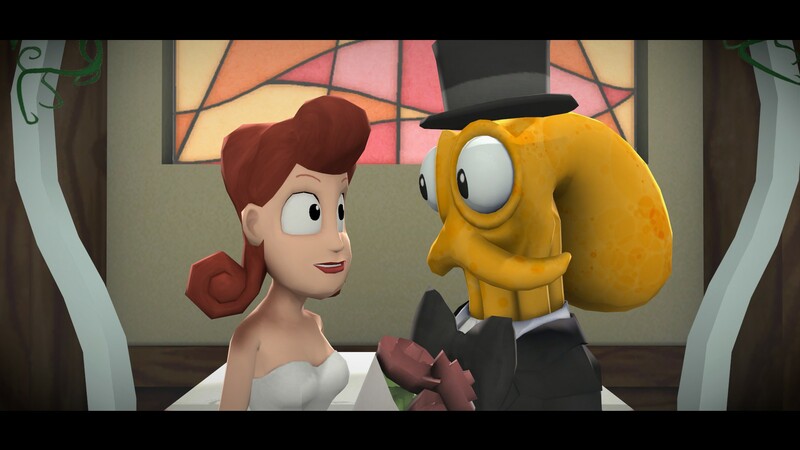 You start the game of Octodad out at a church about to attend a wedding ceremony. The game messes with the joke of Octodad being an octopus in disguise from the offset, throwing little quips about people not noticing he’s one straight away before you even control him. From here, its your job to find your suit and embark on an epic quest of controlling Octodads four limbs to pursue getting to your wedding reasonably presentable. 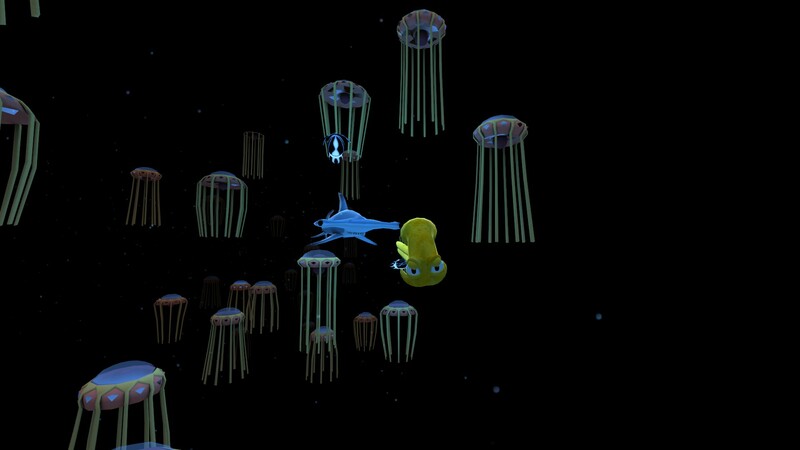 The control mechanics are the core of this game, with Octodad being rather hard to manoeuvre reasonably well. You control his right and left arm with the left and right analogue stick respectively, pressing the RB button to pick things up and pressing it again to put things down. To walk, you press and hold one of the triggers on your controller in order to raise a leg, the longer you hold the trigger down, the higher it goes. Whilst you hold the trigger down, you then use the analogue sticks to control in which direction the leg should point or move. Combining all these actions allows you to manoeuvre Octodad around the world, but you have to be careful, everyone is always watching you, meaning if you make too many mistakes or are too clumsy in how you move Octodad around, you’ll suffer for it when people start to notice you’re not human. Throughout the course of Octodad, you’ll be repeating similar events to the start, with levels designed to push your controls of Octodads limbs to the limits. There will be levels where you have to do household chores, and other levels where you’ll just have to take your family out to the shopping market. The everyday scenarios with this crazy character adds a sense of.. surrealism to the game that I haven’t felt before in others. Who would have thought scanning items through a checkout would be so much fun when it’s considered a chore in everyday life. I suppose you could say that Octodad gets your preconceived notions of boring things in real life and flips them on their head with the introduction of one strange main character. You’d think making a pot of coffee would be pretty easy in a game all about participating in everyday chores, but you’d be wrong. Ocotodad is a nightmare to control (a seeming fit to an octopus impersonating a human), with this chore alone taking up to 5 minutes just to grab the right objects and put them in the right place. The games chore stages couldn’t last forever though, with Octodad starting quite blissful, but turning into a fully pledged story before long. To make sure there’s a narrative, Young Horses have made a arch nemesis to Octodad: a chef. The chefs out to expose Octodad to his family and the world, and he won’t give you an easy ride in his mission to do so. This central theme pops up in places, and adds some urgency to an otherwise slow and weirdly paced game. You’ll be shopping in the supermarket with your family, when all of a sudden the chef appears and you have to run for your life, ensuring you’re not caught, otherwise you’ll need to repeat the sequence all over again. The game starts to change its pace half way through with this introduction of the main antagonist, meaning that the fickle controls are no longer fun and hilarious to use, but are instead annoying and frustrating at times. The final boss encounter for example involved walking across a lot of small beams, which I admit that I spent easily 15 minutes repeating over and over. I understand the developers need for a narrative to ensure that players didn’t feel like they were skimping out, but this narrative with its ups and downs and changes in pace deterred from Octodads core principal: funny controls in mundane situations. Using a badly controlled octopus to sneak past guards or walk across thin obstacles isn’t fun when the mechanics are just not there to support it. You’ll be surprised to learn that there is at least 1 part in the game where you actually get to play as Octodad’s true self, in a fishing section that doesn’t require much action on your part and is more akin to a quicktime event than an actual playable section. Still, it was a nice scene to watch unfold. The humour is great to begin with, but will soon become a little dry after a while, with both the narrative becoming a little more serious in tone, and the jokes becoming stale as time goes on. In this sense, its a good thing Octodad doesn’t overstay its welcome. Coming in at almost 2 hours long (I managed to finish it in 109 minutes), it’s easily one of the quickest games I’ve played in recent memory. This may or may not bother you (I know some people take a game time= value decision), but when it’s on sale in the humble store, I still think its great value for a truly original idea for a game. 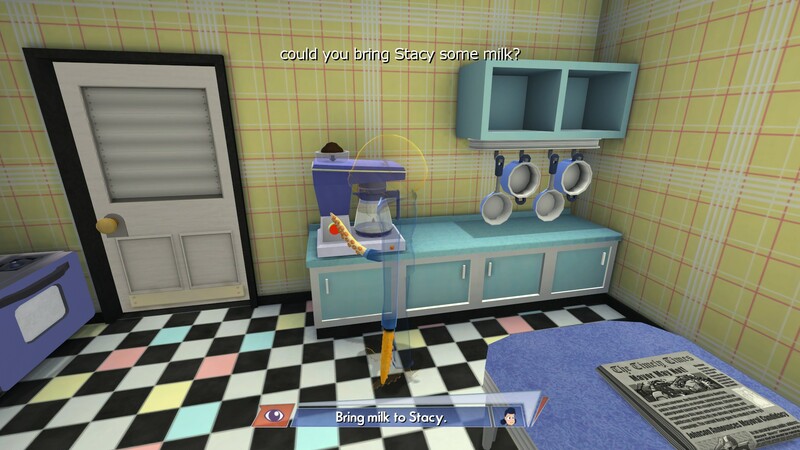 I’m glad Octodad exists. I feel it shows how far our industry has come, where a random game with very random mechanics and a very strange plot can get the backing of a huge publisher like Sony. It also stands as an accumulation of how creative developers can be, allowing them to come up with an idea, and sticking to it through thick and thin. Whilst the game of Octodad itself didn’t set my world on fire, the fact that this game exists at all still excites me even after completing it and having my fill. I truly commend Young Horses for this game, and look forward to their future endeavours.